Posted by B. Daniel Blatt at 6:27 pm - December 21, 2012.
Who should be the Grande Conservative Blogress Diva 2012/13? Posted by B. Daniel Blatt at 6:18 pm - December 21, 2012. With apologies for the failure to get to this until today, I hereby announce the nominees for the 2012/13 Grand Conservative Blogress Diva. Bear in mind that we consider a diva to be a strong, confident woman who commands the respect of men. Posted by B. Daniel Blatt at 6:09 pm - December 21, 2012. 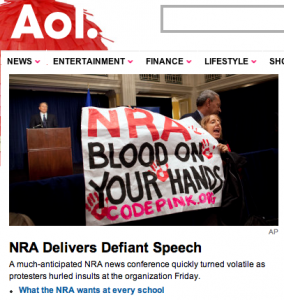 Seems the editors agree with the protestors who hoisted this banner. Posted by Bruce Carroll at 4:54 pm - December 21, 2012. (Washington, DC) Army veteran and OutServe-SLDN Executive Director Allyson Robinson released the following statement in reaction to an aplogy issued today by former Nebraska Senator Chuck Hagel for remarks made in 1998. The apology was reported by Washington Post. “We are pleased that Senator Hagel recognized the importance of retracting his previous statement about Ambassador Hormel and affirming his commitment to Don’t Ask, Don’t Tell repeal and LGBT military families. We look forward to learning more about his commitment to full LGBT military equality as this nomination and confirmation process unfolds,” she said. The hypocrisy of gay groups and their lickspittle use of kneepads when it comes to anything-Obama is more than revolting at this point. Posted by B. Daniel Blatt at 4:28 am - December 21, 2012. LIke many conservatives — as well as good number of independents — who follow politics, I’ve struggled to understand how, after four years of near-constant failure, Barack Obama could have won re-election as President of the United States. He didn’t put forward a plan to improve the economy or addressing the burgeoning debt. He had not shown much willingness to work with his partisan adversaries in Congress. In the ended it seems, low-information voters, together with those more concerned about matters other than the economy and our government’s shaky fiscal state, tipped the scales for the Democrat. People like the idea that Obama is president. As a politician and president, he has only one failing — he is the wrong man at the wrong time to be leading this country. He is out of sync with his age and its crises. There is more proof every day — here and abroad, in nation-states, states and even some cities — that his political theories will lead to disaster, and do so every time they are tried. The Democrat may not have any ideas on how to fix the nation’s problems, but people do like the idea of Barack Obama, the post-partisan healer who can bring people together.